Welcome any demands or suggestions about R/C model power and E-bike, E-scooer charger, BMS etc. C6050A and C6050B is releasd. C6050A can communicate with external device and charge current can be controlled by remote device. C6050B can work on auto charge mode as same as C10325. 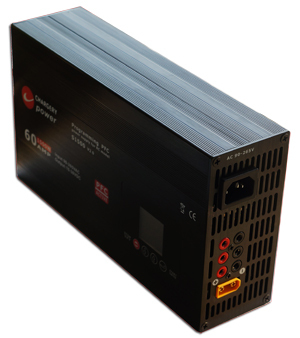 C10350 is in developing , it can charge up to 24S lithium battery at 50A 3000W max. 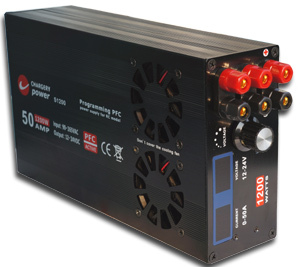 S400 with PFC power supply is released. output DC 6-15V 25A, 400W max. Super BEC is available, up to 14S lipo battery as input, and output up to 25A at 8.4V. 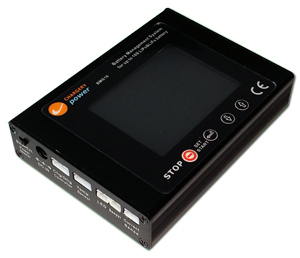 S600Plus is updated to V1.4, it is designed special for 500W charger, output 26V 25A 600W max. output voltage and curren is adjustable. If you need our products but you do not find any distributors or dealers or any online shops who are selling CHARGERY products in your country or any convenient place, please email me directly to buy our products, and you can pay by PayPal. CHARGERY Power is focused on providing enabling charging and battery technologies and services for the R/C model and E-Vehicle including airplanes, boats, cars, electric flight, helicopters and electric vehicles. 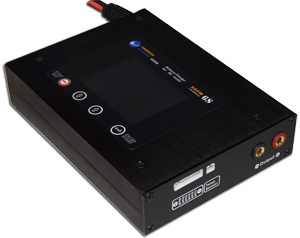 AC & DC dual input charger built-in cell balancer is released. Welcome to back again and consult Chargery. Chargery Product list (2018.3) is available. please down load for more interesting products. 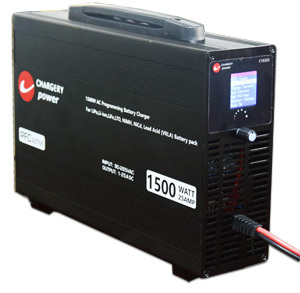 Similar with popular 24S 1500W charger C10325, the new charger C6050 can charge 4S to 13S lipo battery at 55A, 3000W. C6050A and C6050B is available, C6050A can communicate with external device and charge current can be controlled by remote device. C6050B can work on auto charge mode as same as C10325. Charge current: 1-55A, 3050W max. 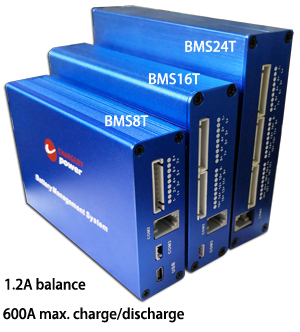 The latest AC and DC dual input balanc charger C4012B is released. Welcome to enjoy CHARGERY balance charger and have a nice flight. In past years, if need to charge and balance lithium battery pack, one power supply (AC-DC SMPS), and one balance charger (DC-DC buck and boost converter) is essential. The power supply power DC balance charger, and balance charger control charge voltage, charge current and balance cell voltage. 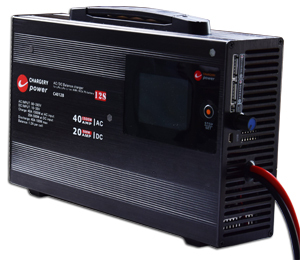 First, C4012B can work at power supply mode, as same as as AC-DC Power Supply to power DC balance charger. Second, C4012B can charge and balance any lithium battery pack as same as DC-DC balance charger. 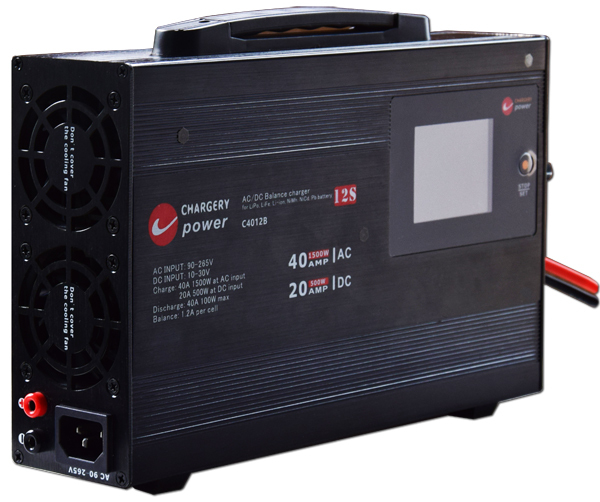 Third, C4012B can charge and balance any lithium battery pack at 40A 1500W when AC 100-240V input. 3 in 1 make the C4012B lower cost and easier to operate. Wrong battery connection protection when multi battery pack connected in series on adapter board. Supports upgrading the firmware program by USB port. Input voltage: DC 10-28V, 30V max. or AC 100-265V. Discharge Current: 0.1-40A, 100W max. 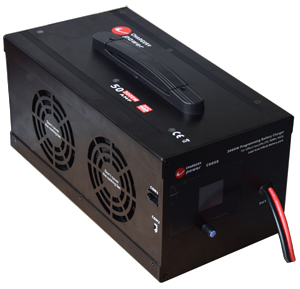 Chargery released high voltage battery charger which is applied to 4 to 24S lipo, Lion, 5-28S LiFe cells, 7S-36S LiTo, 6S-41S lead acid battery (VRLA, GEM) and 10S-68SNIMH&NICD battery. 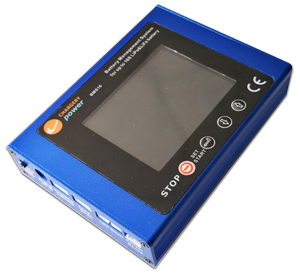 Charge terminal voltage, terminal current and cell count is programmed. 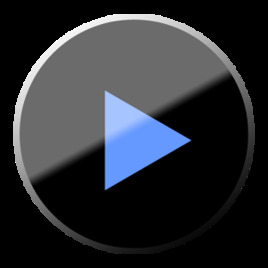 please down load the video for details . Chargery released Balance charger and discharger which is applied to 1 to 10S lipo, Lion, LiFe cells, NIMH&NICD, and Pb battery (VRLA, lead battery). 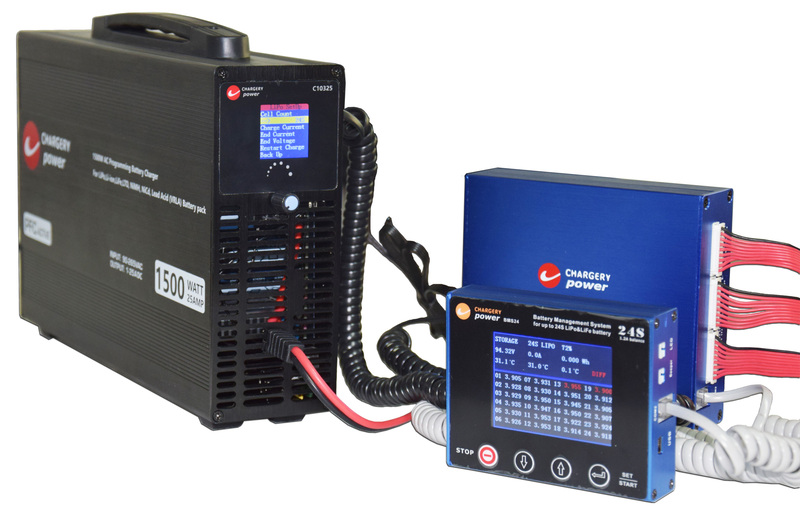 Chargery improved the voltage accuracy t, under 5mV even up to 10S lipo cells, that help us to protect and manage each cell voltage during charge and discharge. Up to 10A discharge 35W max. 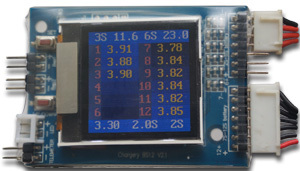 Chargery released BMS (Battery Management System), which is applied to 2 to 24S lipo & LiFe cells . We focus on developing the advanced balance technology to meet different applications. 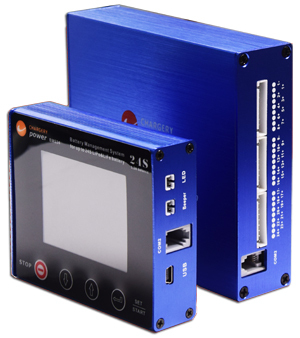 Chargery improved the voltage accuracy to under 5mV, that help us to protect and manage each cell voltage and SOC. Support regenerative braking, during braking operation can charge the batter pack and the discharge power (Wh) will decrease to response to the braking power. Charge/discharge current up to 300A. 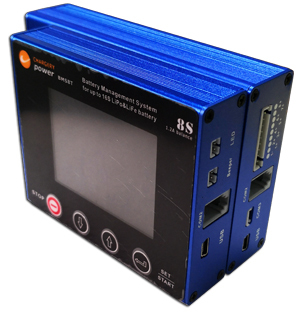 BMS16 calculate and display the charge and discharge power (Wh), generally the battery rated power is rated voltage multiply rated battery capacity. 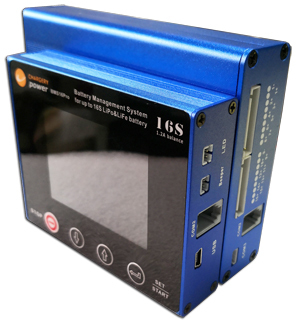 TFT LCD screen that provides rich information including current, voltage, power, capacity, control status, SOC and temperature and so on. 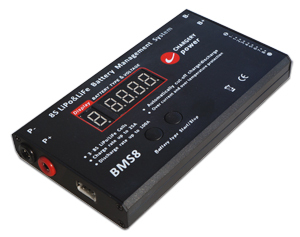 BMS16 features a maximal safety protection, within the range parameters can be setup, BMS16 will alarm and cutoff charge or discharge according to users’ setup, out of range of parameters, and trigged absolute maximum ratings BMS16 will force to cutoff charge or discharge to prevent the battery from fire. 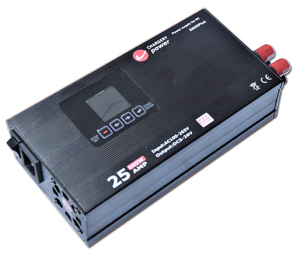 Minimize the power consumption by draw current from all cells or external power supply. Dual power design, the unit can be powered by all cells or external power supply. Detect cell count at any time, and compare with the count detected when switch on first time. If it is not uniformity, the device will alarm and cutoff charge or discharge according to users’ setup, the feature can prevent any cell connection from loosing. Sound alarm and LED alarm will be triggered when any warning events happened, and then wait several seconds cut off or NOT charge or discharge. The delay time can be programmed. 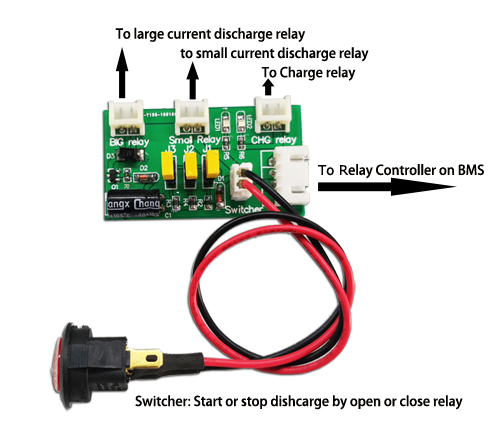 Charge relay and discharge relay are controlled independently. Two temperature sensors monitor battery temperature on different location. 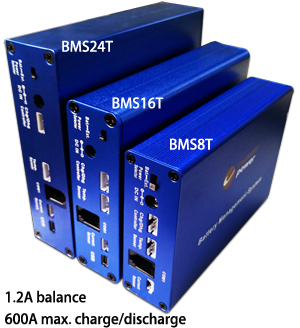 BMS16 provide users the maximal flexibility, key parameters can be programmed. 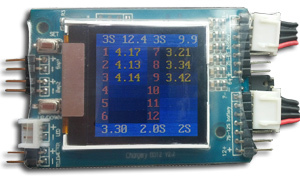 BMS16 display battery SOC or called battery gauge similar with car dashboard. 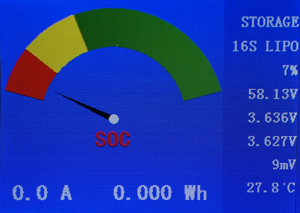 Cell count, battery pack voltage and battery gauge (%) is displayed simultaneously. In case that the battery pack need not be charged and discharged, Press STOP button enter into sleep mode to save energy consumption. Charge and Discharge is cut off, LCD back light is off. Press any key to resume normal work mode. S600 Testing report in Germany. S1200 testing report in Germany. BEC testing report in Germany. Low Voltage 15A BEC released. 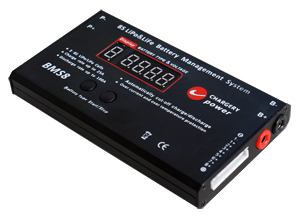 Charger BECLV takes input voltage up to 25V (6S) and steps it down to a user-selectable voltage, and withstand high current loads of 10Amps continuous. Testing report in Germany by www.rc-heli-action.de (1620K) . High Voltage 20A BEC released. 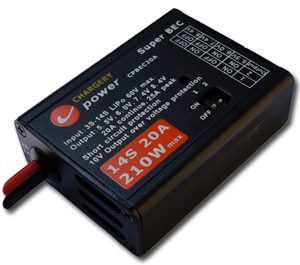 Charger Super BEC is the most powerful Battery Eliminator Circuit in RC industry, it can handle high voltages up to 60V and withstand incredible high current loads of 20 Amps continuous in so small space. It is designed especial for digital Servo. 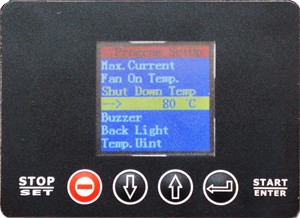 No AC ON/OFF switcher, more reliable when start. 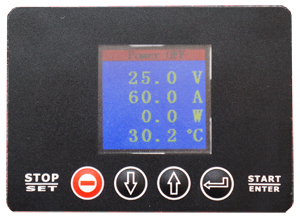 1.8" TFT color LCD display voltage, current and temperature, and output power. Low power consumption (less than 1W) at idle mode. 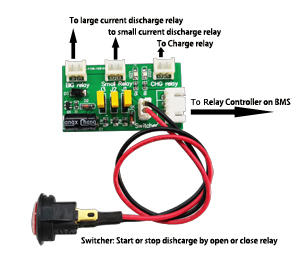 3 outputs can do more chargers or other DC powered device simultaneously. Testing report in Germany by www.mfi-magazin.com (907K) . First up to 12S LiPo&LiFe battery saver with TFT color LCD, totally monitor all cell voltage during flight or after land off, warning voltage, warning time, delay time for warning can be programmed as your preference. Record lowest voltage for each cell during flight, so you will find the worst performance cell in your pack. The device can detect 2 packs connected in series or parallel. Two loud beeper(95dB) and one high light LED is for alarm purpose. Feel free to search, email or call us for further information about CHARGERY and products .